Photograph of the Neminatha Temple in Mount Abu from James Burgess' 'Photographs of Architecture and Scenery in Gujarat and Rajputana' taken by Colin Murray in c.1872. Mount Abu is an important place for Jain pilgrimage renowned for the group of temples at Dilwara built during the Solanki period and representing the most perfect example of western Indian style. This is a view looking up towards the ornately carved interior of the dome of the mandapa of the Neminatha Temple. This temple, which was built in 1230, is entirely made of white marble intricately carved. The ceiling is carved in concentric tiers to symbolise the Jain view of the universe as a series of cosmic cycles. 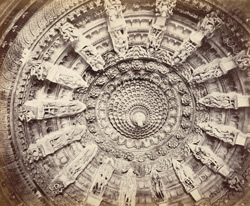 The large corbelled dome has brackets carved as beautiful maidens and the central lotus has a cluster of pendant buds.